I've been watching baseball since the mid seventies (although, I'm sad to report I've watched very little the past few years). 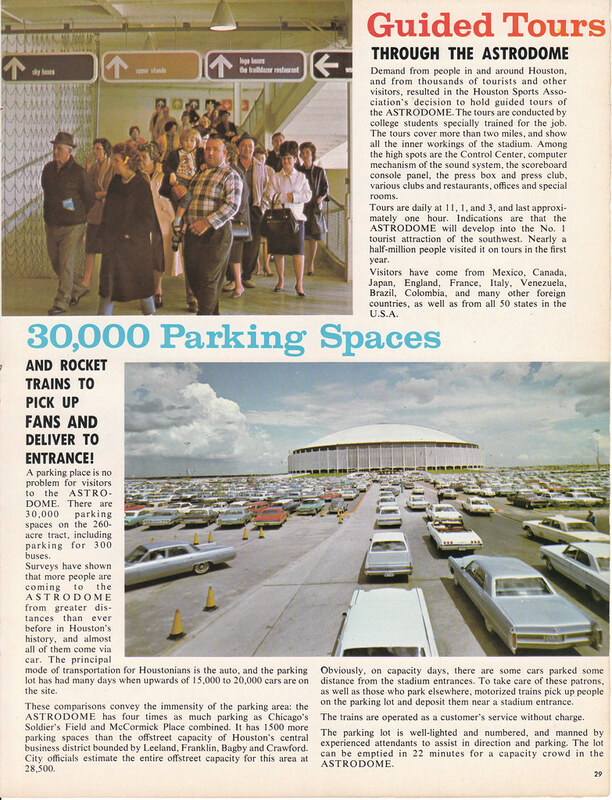 So, I knew the Astrodome was a big deal. I knew it was the first of its kind and mega expensive for its time. 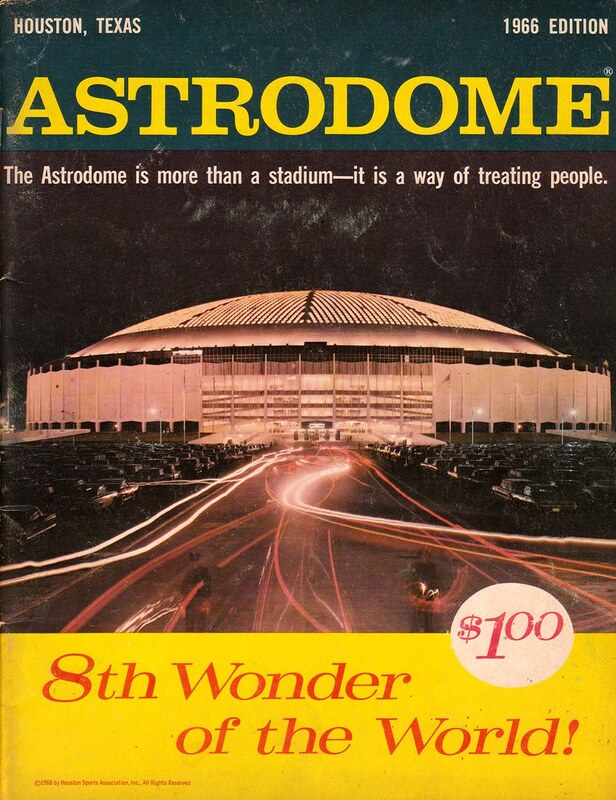 However, I recently acquired a 1966 booklet entitled Astrodome: 8th Wonder of the World, and, holy crap, I had no idea the level of orgasmic enthusiasm over this thing. When they say its the 8th wonder of the world they actually mean it! 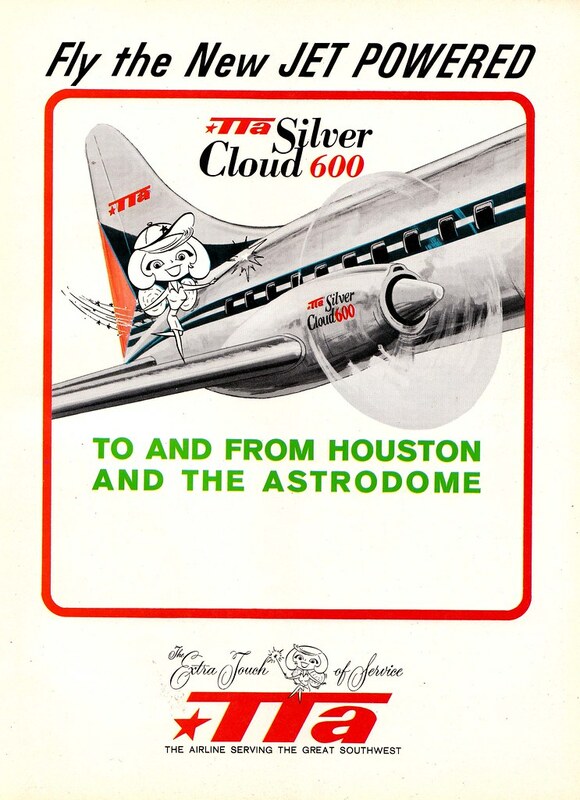 "Comparisons between the Rome Colosseum and Houston's AStrodome are inevitable. Each in its time and place is something very special.... 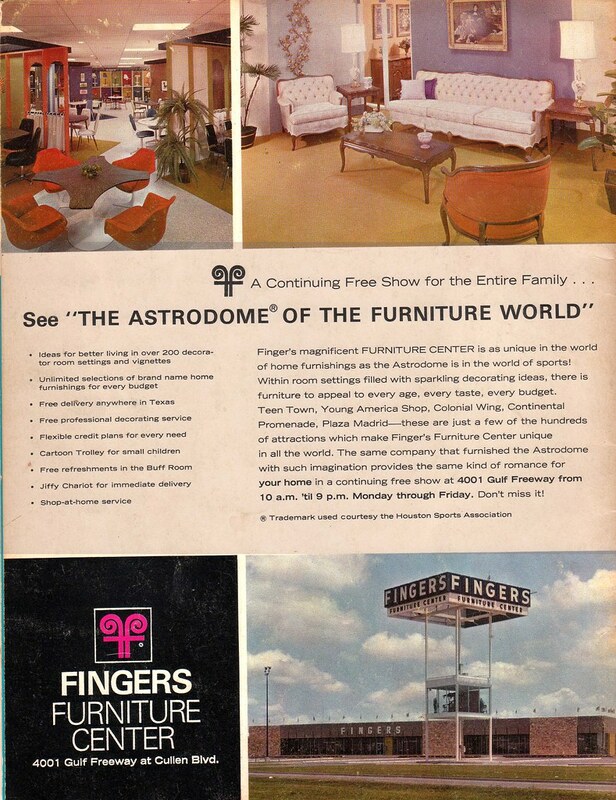 The Astrodome is bigger, brighter and has a multiplicity of conveniences and appointments far beyond the Colosseum..."
I must admit, looking at this spread on the various themes of sky boxes, I am very impressed - these are some badass rooms. I mean, Nebuchadnezzar had some nice hanging gardens, but did it have coffee tables shaped like dice? Did it have a "Skydome Club"? I didn't think so. 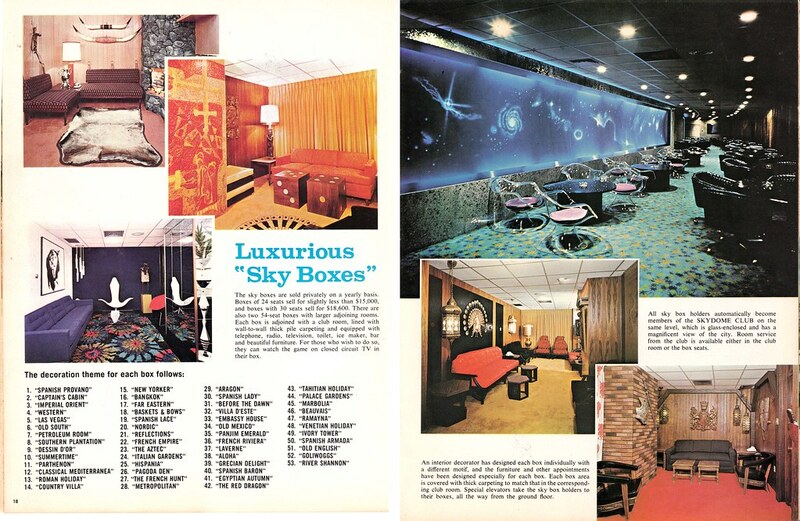 Imagine watching Nolan Ryan or Joe Morgan from the comfort of your "Egyptian Autumn" skybox, or "The French Hunt". I'm curious what "The Laverne" looked like..... we can only hope they are referring to Ms. De Fazio. "The sports fan who comes to the Astrodome steps right into the Age of Automation. His comfort is insured by a space-age Control Center nicknamed 'The Brain' by stadium personnel. The Stadium Control Center, a 17 ft. console, combines the most modern system of electronic and mechanical gauges, scanners, testers and instruments of control ever put together in one operation. The Brain replaces 280 men who would be working continuously to keep the air conditioning working"
The scoreboard they are so proud of seems laughable by today's standards. Compare this to what's hanging above the Dallas Cowboys and you can see how far technology has come. Wow. I know there's been decades of inflation, but I'm still amazed at these prices - especially considering the state-of-the-art nature of this much heralded stadium. You could never afford to pay A-Rod $185,000 per game with those kind of prices. fa sweet jezus look at those ticket prices! Thanks for the memory trip - my Dad took me and my brothers there probably around 67 - I don't remember a dang thing from the game, I was a wee youngun. I do faintly recall walking through the parking lot in blistering heat for what seemed to be forever. Wasn't there a movie in the 70's about killer bees that swarmed on a vehicle that was driven into the Astrodome to disperse the bees due to the cooler temperatures? I can't remember the name of the movie, but I guess the Astrodome can even save you from killer bees. That was the Superdome and I only remember it, because I'm originally from New Orleans. I can hardly remember the movie though. I hate sports, but I'd put up with a baseball game to hang out in that bar. I happened to be at the last game played in the Astrodome in 1999. The Astros were in the playoffs and got eliminated at the Dome. It was a great place to see a ball game. The replacement facility, Minute Maid (formerly Enron) Field is also a great place, maybe even better with a retractable roof. Meanwhile, the Astrodome sits empty as the city of Houston can't make up it's mind what to do with the former 8th Wonder of the World. I think they really want to tear it down (which would be typical for how history is treated around here) but the people of Houston really loved the place and wouldn't put up with it. There have been lots of ideas proposed, but so far nothing. why don't they make it into either a baseball museum or maybe let people live there? 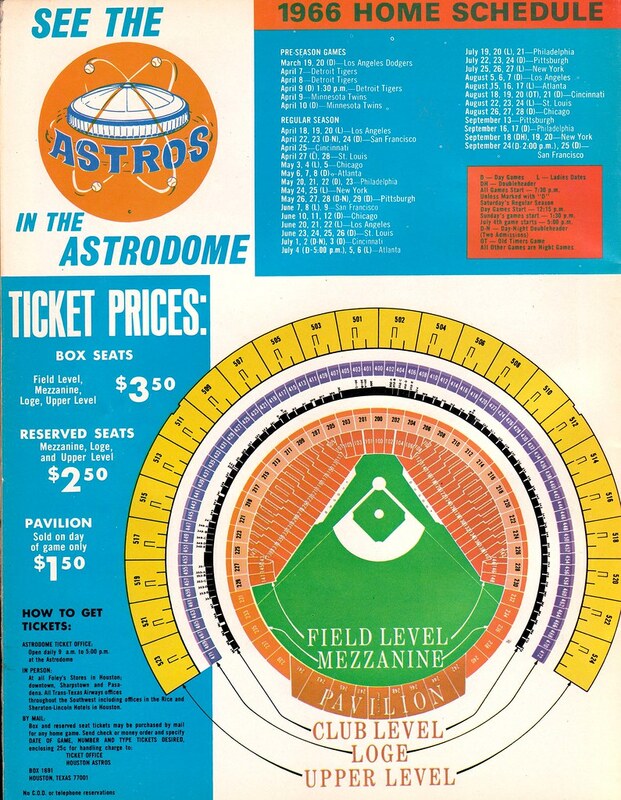 Pitchers loved the Astrodome. Long fly balls that would have gone out of any other park ended up dying on the warning track. Naturally, most hitters hated the dome, though a few like Jimmy Wynn did pretty well there. I believe there are only two parks with Astroturf these days (Toronto and Tampa Bay). It was all the rage in the 1970's, until big name players started wearing out their knees on it. .Everyone else has gone back to grass now. The Dome was designed with glass panels in the roof and the field was originally real grass. But the ceiling was so bright during day games that the fielders couldn't see the ball. So they painted the panes. Then the grass died. There was a movie where that happened, but I'm not sure if this is where it took place. Saw a game there in April '89. There had been a brief strike (go figure!) and the players weren't in the best of form. The game wasn't great, but it was cool to see the Dome. $24.60, $17.57 and $10.54. By comparison the cheapest seat (not an SRO seat) is $13 at the Astros' new ballpark. That was The Savage Bees and the dome was the Superdome. Somebody's red VW attracted the bees and they slowly drove it into the dome and dropped the temp. Regarding the TTa ad: So that's what William Shatner saw on the wing. I watched Tom Seaver (Mets) vs J R Richards (Astros) in the Dome. Sat high up, right behind the plate. All some display of two very different pitching styles. 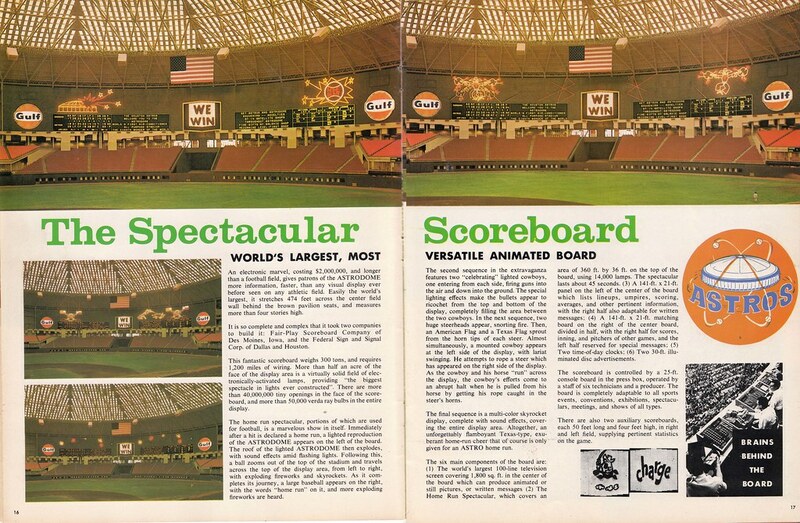 The Astrodome would make a great film studio! The dome bring so high off the ground it can start it's own weather pattern! Make a great substitute for PINEWOOD STUDIOS in ENGLAND where Space:1999 was once filmed. Too bad they don't set up shop in it to remake SPACE:2099 -there would be lots of room! 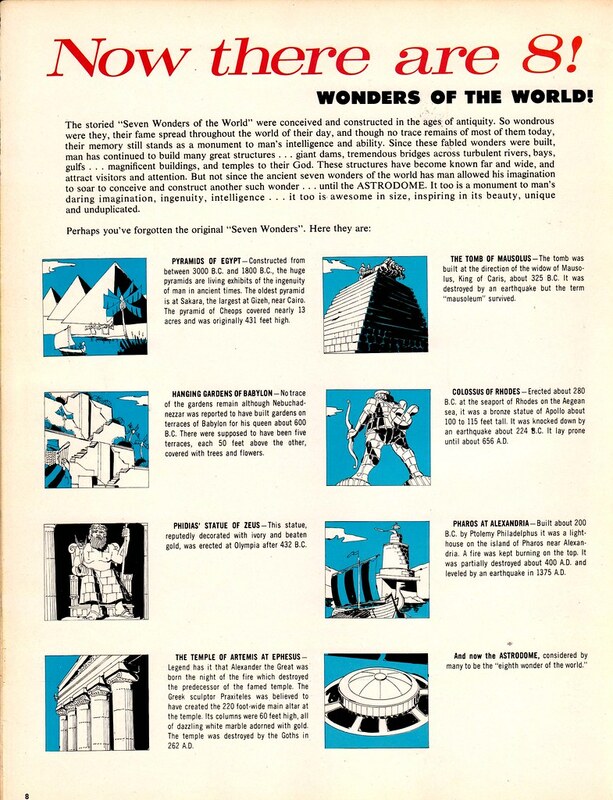 There's a small press comic book in which The Astrodome appeared in use as a post-holocaust greenhouse ! The Astrodome was the real star of Robert Altman's bizarre "Brewster McCloud". Don't forget the Bad News Bears In Breaking Training. "Let them play! Let them play!"